The horror! If the thought of donning a Canadian tuxedo makes your stomach turn, we have news for you! Street stylistas have transformed the Jerry Seinfeld-esque double denim nightmare into a stylish, lust-worthy dream. No longer is double denim the ultimate fashion faux pas, seen as the uniform of an awkward uncle or the cover of a Babysitter’s Club book. Double denim is now worn by fashion lovers worldwide, regularly turning up in fashion mag spreads and high street stores. 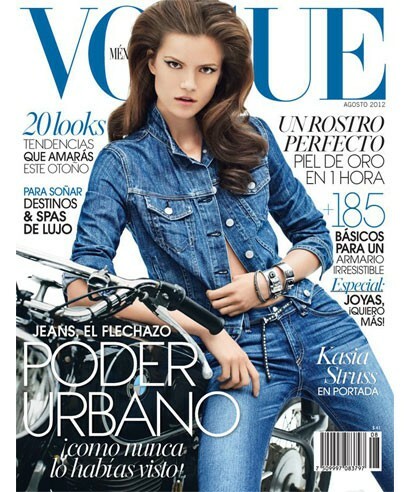 Less costume, more cool, double denim is everywhere. 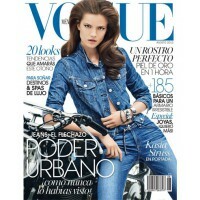 Supermodel Kasia Struss’ double denim delight on Vogue Mexico’s cover in August 2012 is rumoured to have helped the denim army’s cause along quite nicely for the coming seasons. But look out! The double denim trend is a tricky one to master... The key to avoiding cringe? Less matchy matchy, more compare and contrast. Take tips from street style goddesses Alexa Chung and Amanda Heard and mix powder blue chambray shirts with heavy hued skinny jeans. Not into the simple look? Get layering! Denim vests that look more fun femme than butch biker are ideal for adding layers to your look. Still too shy to get your denim on? The easiest way to double denim your way to stylish chic is to have contrasting silhouettes (eg. skinny jeans, baggy shirt) mixing varied denim tones and colours. Jeans brands are a huge part of fashion's ‘it’ scene, so your denim choices are endless! Head to your wardrobe, don your existing denim pieces and give it a go! If your double denim look seems perfectly complete with vintage cowboy boots, it’s back to the drawing board I'm afraid!